"Beto O'Rourke and other Democrats urge public to keep Tornillo migrant facility in spotlight" was first published by The Texas Tribune, a nonprofit, nonpartisan media organization that informs Texans — and engages with them — about public policy, politics, government and statewide issues. The detention center at Tornillo, referred to as a “tent city" by critics, was originally thought to be a temporary fix that wouldn’t be needed for more than 30 days. That's what the incident commander that oversees operations there said in June. But the contract with the facility operators has been extended several times since, costing taxpayers about $144 million through November. The other members of Congress who toured the facility with O’Rourke — U.S. Sens. Mazie Hirono of Hawaii, Tina Smith of Minnesota, Jeff Merkley of Oregon, and U.S. Rep. Judy Chu of California, all Democrats — said about 800 children at the facility had sponsors ready and waiting to receive them. But Hirono said those sponsors are still undergoing background checks and fingerprinting before those children are released. Officials from the federal Health and Human Services agency, which oversee the Trump administration's policies for unaccompanied minors, said in an email it does not monitor its media-request email on holidays or weekends. But an agency fact sheet about Tornillo confirmed there are about 2,800 minors at the facility, 21 percent of whom are female. Since it was erected, about 6,000 children have been placed there and more than 3,100 have been released. O’Rourke won't be part of any of those efforts in Congress, as he is set to leave office in less than a month after choosing to give up his seat to unsuccessfully challenge U.S. Sen. Ted Cruz. But his successor, El Paso Democrat Veronica Escobar, made clear Saturday she’s happy to continue O’Rourke’s efforts to keep the issue in the spotlight until Tornillo is shut down. 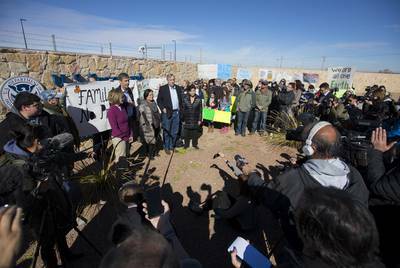 Beto O'Rourke and other Democrats urge public to keep Tornillo migrant facility in spotlight By Julián Aguilar December 15, 2018 TORNILLO – It’s been six months since a group of lawmakers first joined hundreds of people here to protest an immigration facility for undocumented minors that had been erected just days earlier in this small farming community. Since then President Donald Trump’s administration has tried to deter immigrants from seeking asylum through executive orders and increased enforcement at ports of entry, deployed active duty troops to the border and asked the U.S. Supreme Court to finally eliminate the Obama-era program known as Deferred Action for Childhood Arrivals, or DACA. In that same time period however, the population at the detention center has quietly swelled from a few hundred to about 2,800, according to the U.S. Rep. Beto O’Rourke. The El Paso Democrat returned to Tornillo on Saturday to lead a delegation of lawmakers to tour the facility and try to find out what’s next for the juveniles being held there. But the group was also there to deliver a message to the immigrant rights groups and their supporters in attendance: Don’t let up. “The public pressure that you brought to bear after Father’s Day, that ended the practice of family separation, we need that same pressure again brought to bear on this administration to close down Tornillo,” O’Rourke said, referring to the former federal policy that resulted in undocumented immigrant children being separated from their parents. The policy was later halted after a public outcry. The detention center at Tornillo, referred to as a “tent city" by critics, was originally thought to be a temporary fix that wouldn’t be needed for more than 30 days. That's what the incident commander that oversees operations there said in June. But the contract with the facility operators has been extended several times since, costing taxpayers about $144 million through November. The other members of Congress who toured the facility with O’Rourke — U.S. Sens. Mazie Hirono of Hawaii, Tina Smith of Minnesota, Jeff Merkley of Oregon, and U.S. Rep. Judy Chu of California, all Democrats — said about 800 children at the facility had sponsors ready and waiting to receive them. But Hirono said those sponsors are still undergoing background checks and fingerprinting before those children are released. “It’s doing two things, it’s creating tremendous delay in approving these sponsors,” she said. “And I think it has a chilling effect on sponsors coming forward because this information, and many of the sponsors are undocumented, is shared with [Immigration and Customs Enforcement] and what ICE does is deport people.” O’Rourke said that 170 of those potential sponsors have been arrested, and the majority of those had no criminal history. “My request of the contractor was not to renew the contract unless HHS stops sharing information with ICE,” O’Rourke said. “There is no reason to spend $144 million going forward and to keep these kids locked up.” The current contract is set to expire on Dec. 31 and O’Rourke said it’s unclear what will happen to the children there if it isn’t renewed. Officials from the federal Health and Human Services agency, which oversee the Trump administration's policies for unaccompanied minors, said in an email it does not monitor its media-request email on holidays or weekends. But an agency fact sheet about Tornillo confirmed there are about 2,800 minors at the facility, 21 percent of whom are female. Since it was erected, about 6,000 children have been placed there and more than 3,100 have been released. Democratic members of Congress speak to the press after touring the Tornillo immigration facility on Dec. 15, 2018. Ivan Pierre Aguirre for The Texas Tribune Following the November elections, Democrats are weeks away from taking control of the U.S. House. Some expect to use that power in part to demand more oversight of the Tornillo facility should it continue operating into 2019. “When we take over the [U.S.] House on January 3rd, I want to make sure that one of the first things we do is have a hearing on this situation,” Chu said. “The American public doesn’t know how outrageous this is.” Merkley said that a bill has been filed in the U.S. Senate that would guarantee lawmakers could gain access to detention facilities for oversight in one day. Lawmakers sometimes have had to wait weeks before being granted permission to visit Tornillo, he said. O’Rourke won't be part of any of those efforts in Congress, as he is set to leave office in less than a month after choosing to give up his seat to unsuccessfully challenge U.S. Sen. Ted Cruz. But his successor, El Paso Democrat Veronica Escobar, made clear Saturday she’s happy to continue O’Rourke’s efforts to keep the issue in the spotlight until Tornillo is shut down. “It’s all about the 24-hour news cycle, it’s all about the next piece of information, it’s all about the next scandal coming from the White House,” she told the crowd. “While we have to pay attention to all of that, we cannot forget the children that are being held in U.S. government prisons for having the audacity to seek refuge in the arms of America.” Read related Tribune coverage With contract set to expire, still no word on what's next for immigration center at Tornillo No one on the inside can talk about what’s happening at the tent city for migrant kids Federal government to greatly expand Tornillo shelter for unaccompanied minors "Beto O'Rourke and other Democrats urge public to keep Tornillo migrant facility in spotlight" was first published at by The Texas Tribune, a nonprofit, nonpartisan media organization that informs Texans — and engages with them — about public policy, politics, government and statewide issues. Link back to the original article, which is located at https://www.texastribune.org/2018/12/15/beto-orourke-democrats-tornillo/.